Today I have with me the bestselling author of the "Terms" series, Lorrie Farrelly. 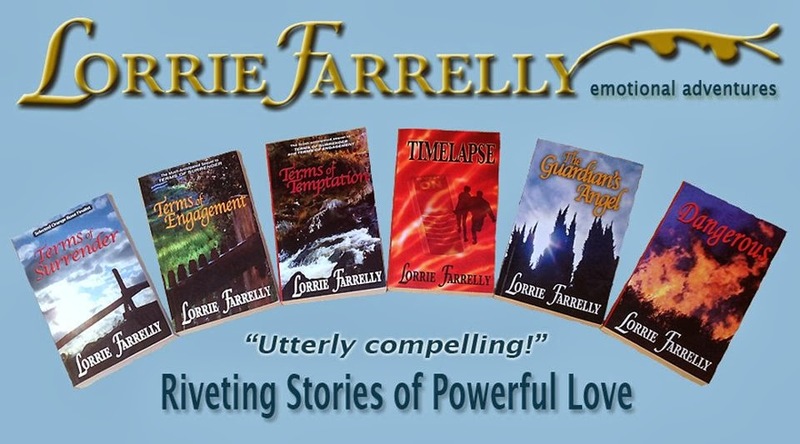 Lorrie Farrelly is the author of a Western historical romance trilogy, contemporary romantic suspense novels, and sci-fi/paranormal romantic suspense novels. A graduate of the University of California, Santa Cruz, and Northwestern University, she has earned READERS’ FAVORITE 5 STARS and been an ORANGE ROSE AWARD finalist. She’s been a Renaissance nominee for Teacher of the Year, a ranch hand at Disneyland's Circle D Ranch, and a “Jeopardy!” champion. She and her family live in Southern California. 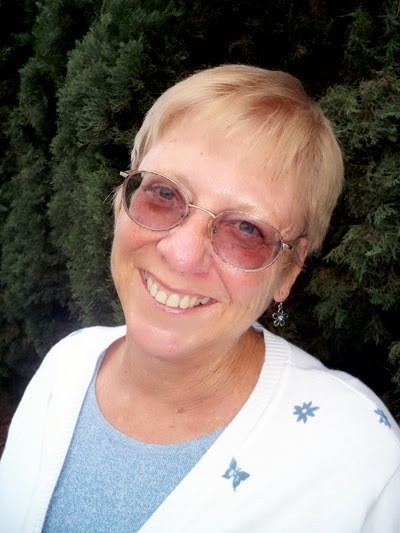 Welcome to Njkinny's World of Books, Lorrie! I’m the author of a Western historical romance trilogy, contemporary romantic suspense novels, and sci-fi/paranormal romantic suspense novels. A graduate of the University of California, Santa Cruz, and Northwestern University, I’ve earned READERS’ FAVORITE 5 STARS and been an ORANGE ROSE AWARD finalist. I’ve been a Renaissance nominee for Teacher of the Year, and a summer ranch hand at (California) Disneyland’s Circle D Ranch (caring for the horses that pull the Main Street streetcars, the castle moat swans, and the Jungle Cruise cockatoo – yes, he’s real!). I was on the television game show Jeopardy! and did pretty well, thanks to my knowledge of random, useless stuff. I love travel, writing, movies, kids and animals, and, of course, books! My family and I live in Southern California. Q2. Which books have you written till date? TERMS OF SURRENDER: Western historical romance, set 1865-1867. Former Civil War cavalryman who has lost everything heads west; stands with a young woman and her little brother who are defending their land and their lives against a treacherous land baron. TERMS OF ENGAGEMENT: 2nd book in the series, set in 1885. The little brother from first novel has grown up and is now a doctor, as well as a widower with a young daughter. He shelters a woman and her toddler son, who are on a desperate flight from a cruel, wealthy, abusive man. TERMS OF TEMPTATION: 3rd book in the series, set in the late 19th-early 20th centuries. Courageous, impulsive daughter of Civil War veteran and rancher has a passion for wildlife conservation and rehabilitation – and for an obstinate game warden. Please note all three books can be read as stand-alone novels. However, because characters recur, reading them in order would be most satisfying. TIMELAPSE: Sci fi/time-travel romantic adventure. A desperate man stranded in a world he no longer recognizes joins with a courageous young freedom fighter. To have a future, they must somehow prevent a terrible crime from occurring – over 100 years in the past. DANGEROUS: Contemporary romantic suspense. A former Los Angeles police officer, weary of stress and urban violence, moves to a small, Central California town in search of a peaceful haven. He should have been more careful what he wished for! THE GUARDIAN’S ANGEL: Contemporary, paranormal romantic suspense. A detective and a child therapist who share an uncanny psychic link take a young murder witness – a small, autistic boy – on a desperate flight to safety. Q3. You write varied books falling under different genres. Out of all these genres which is your favorite and why? Q4. where do you get your ideas? What kind of research do you do for your books? Some of my books have settings such as Lee’s surrender at Appomattox (ending the American Civil War) or life in turn-of-the-20th-century Washington, D.C. Those required quite a bit of research, but I enjoyed doing it because I was so interested in those times and events. Others, such as Dangerous , have settings I’m quite familiar with, and so required less research. But honestly, research can be so much fun and so involving that sometimes I almost forget to actually do the writing! Q5. I recently read your book Terms of Surrender and really liked it. Tell us something about this book and what kind of research did you do for this? I was so intrigued and moved by this. What would such a defeated soldier feel? Bitterness and loss, certainly. Would he still have hope for the future? What if he had nothing to go home to? (Much of the South had been ravaged.) Not only that, but many officers in the Confederate Army had actually been United States Army officers prior to the war. Quite a few were West Point (US Military Academy) graduates. What kind of struggles of conscience had these men had, and what compelled them to turn their backs on the nation they’d sworn to defend? For many, it was a terrible, heart-breaking decision, complicated by the barbarity of slavery. These were all issues one of the main characters of the story, former cavalry Captain Michael Cantrell, must face. Q6. Which was your first book? Do you have any happy memory related to it? Q7. What are the steps that you follow to get your books published? How has the method changed (if it has) since the first time you got published to the present day? As an independent author, I published through Amazon Digital Services. I had had some frustrating experiences in the past with publishing house editors. One complained that she “didn’t see what the West had to do with the Civil War,” and another wanted “nicer” villains. I ultimately decided to take my work, and my career, into my own hands. It was very much the right decision for me, and it has remained so. My favorite book of all time is To Kill a Mockingbird by Harper Lee. Timelapse , and that also drives the brilliant Stephen King's novel 11/22/63 . Q13. How has the writing world changed since the first time to the present day? Has it changed for better or for worse and why? I think there are many, many more opportunities for writers today in every field imaginable. At the same time, there is an overwhelming amount of material out there, and not all of it is of professional quality. Getting noticed and developing a career in writing is as tough as it ever was, maybe more so. Q14. What advise would you give to the newbie authors/ the aspiring ones? Be persistent. Write well. (To do this, a person must read, read, read!) Join in the online community of readers and writers and pay attention to what they say has worked for them. Make every effort to put your work forward in a professional manner. And by all means, write the book you’d love to read! Q15. What are your upcoming books? I have a couple of works in progress at the moment, but am not close to publishing them yet. Q16. How can the readers connect with you? Q17. Before you go how about an excerpt from two of your most acclaimed works Terms of Surrender (a Western Historical War Romance) and Timelapse ( a Sci-Fi, Time travel romance). The wounded man's grip was like iron. Annie couldn't imagine where his strength was coming from. She could feel his whole body trembling against her, and the bandages wrapped around his shoulder and chest were soaked with sweat and fresh blood. "No!" he cried, glaring at her with wide, wild eyes, feral and ferocious in the candlelight. "You can't ... have him! I ... let him ... before ... No! Gavin!" "Captain Cantrell! Michael!" Unable to wrench his hands from their grip on her small brother, Annie shifted and took Michael's face in her hands, her fingers spread along both sides of his hard, sweat-slick jaw. Turning his head, she forced him to look into her eyes. "Michael!" she commanded. "Listen! You must let go! He's not Gavin!" A flicker of confused uncertainty came into the man's eyes, and the huge, black, dilated pupils seemed to constrict slightly, giving Annie a glimpse of deep blue irises. "Yes, that's right, that's right. Good. Now listen to me, listen to me." Her words, and the gentle stroking of her fingers, became fluid, hypnotic. And finally, Michael listened. He could feel the warmth of her breath on his cheek, and for a single, brief moment all pain disappeared, replaced abruptly by a great hitch in his chest. He was dead certain his heart had stopped. "Are you an angel?" he whispered. JESSIE swam up from a deep, dreamless sleep, a relaxed, satisfied smile still curving the corners of her mouth. She stretched luxuriously and reached for Alex. Eyes still closed, she frowned at the rough feel of a heavy wool blanket next to her skin. What did she need a blanket for? It was summertime, and the room was already warm. She stirred, but instead of Alex's arms cradling her, she felt the coarse, lumpy cushion of a pile of burlap sacks. Jessie opened her eyes, decided reasonably that she was still dreaming, and closed them again. A moment later she came wide-awake with a jolt of full-blown panic. As though still trapped in sleep, she tried to scream, but her throat closed and she couldn't make a sound. She thrashed against the blanket that tangled around her and gave in to hysteria. Then, mercifully, the screams came. He seemed to materialize out of nowhere in the dim light, wrapping her struggling body in his arms, pulling her protectively against him. Her cheek rubbed against coarse, starched fabric, her hands caught in straps that seemed to run vertically up his chest. The strange sensations increased her confusion and she struggled frantically to escape. Alex tightened his hold, letting her flail against him. He murmured soothing reassurances into her ear, his voice hoarse and strained. "Jessie, it's all right, it's me! I'm here! You're all right, sweetheart, you're okay. Listen, Jessie, listen to me. Settle down, it's all right, it's all right." Finally his words got through to her. She sank down against him, her heart racing like that of a wild creature. Alex sat on the pile of dusty sacks, leaned back against the rough stone wall in the corner of what seemed to be an old storage cellar, rocked her gently. He continued to murmur soothing words to her, and when she had calmed enough to listen, he tried to explain the unexplainable. "It brought us both, Jessie," he said, a sort of giddy wonder in his voice. "One of us must have stumbled on the program. No matter, it brought us both." "What...brought us?" She had no idea what he was talking about. He risked easing his hold on her long enough to tug the device from a pocket and place it in her hand. She stared at it without comprehension. Then, as realization dawned, she regarded it with awestruck horror. She gripped his arm with one hand, clutched the small device with the other. "But where, Alex? Where did it bring us?" Desperately Jessie looked around again, but the cellar receded into shadows. She could see only stacks of crates, barrels, and piled sacks. A small, grill-covered window high on one wall admitted just the faintest gray shaft of early-morning light. Alex shook his head and gently opened her fist. "Not where,” he said, and after a long moment, she hesitantly followed his rapt gaze to the device's small, glowing screen. "Not where, Jessie. When."